Shuffleboard is a game where players attempt to score points by sliding circular discs into the scoring area, similar to the Olympic game of curling. There are two basic styles of shuffleboard. One type of shuffleboard is played in a seated position using a tabletop as the board. 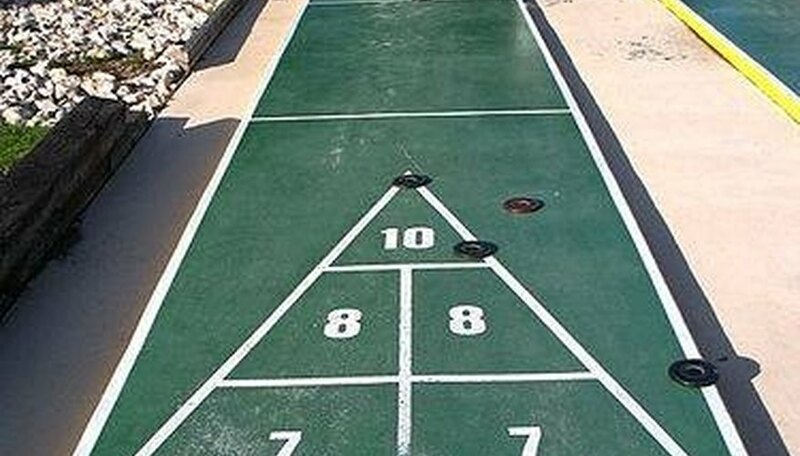 The other type of shuffleboard is the outdoor/deck version of the game, where players stand and use a larger board placed on the ground. Shuffleboard is a game most commonly associated with boat cruises and retirement communities; however, shuffleboard is a game that is fun for all ages and is easy to learn. Shuffleboard is played sliding their four colored discs, which are also called weights, or pucks, down the board toward the scoring area. To push the pucks each player uses a "cue," which is a stick with a half circle opening at the end which fits around each puck. A regulation sized shuffleboard deck is 39 feet by 6 feet, however, smaller shuffleboards are sold to fit on a backyard decks. There is a triangular scoring area at each end of the board on which players try to make their pucks stop. The tip of the triangle is marked "10" and is the smallest section of the triangle, making it the hardest stop of land a puck. The next section is a left and right area marked "8," which is slightly larger than the 10-point area. The third section of the triangle is a left and right area marked "7." After that, there is a section outside of the triangle known as the "10 off" area. Players decide who shoots first and what color each player will use. Players start on the same side of the board, shooting their pucks toward the same scoring area. Players alternating sliding their pucks down the board, attempting to make their pucks land in the scoring area as well as trying to knock their opponent's pucks out of the scoring area. After all of the pucks are shot, the points for the pucks that remain in the scoring area are totaled and play resumes, with the players now shooting their pucks toward the opposite scoring area. Play ends when one player reaches 75 points or both players have completed 10 rounds -- whichever comes first. Points are totaled only after all of the pucks are shot. If a player knocks another player's puck out of the scoring area, that puck is no longer scored. Points are only scored if the puck is entirely inside of one of the numbered scoring areas. If a puck is touching the side of a numbered section, that puck does not receive any points. There are a few ways in which points are deducted in any given round of play. First, if a player slides their own puck beyond the scoring triangle and into the "10 off" zone, 10 points are deducted from that player's total. If a puck is knocked into the "10 off" zone by another player, the player whose puck was knocked into that zone will be deducted 10 points. If a player's puck is touching the line of the "10 off" area on the shooting side before their puck is played, they will be deducted 5 points. For any shot that lands on the sideline or off the side of the board will be deducted 10 points. If any part of a player's body crosses the baseline while shooting a puck, that player is deducted 10 points. Finally, if a player accidentally shoots another player's puck, they are deducted 10 points.